Smile Brands Inc., one of the nation’s leading providers of business support services to dental groups in the United States, is announcing today’s relocation and grand opening of its newest Bright Now! Dental office. After more than 19 years at the at 1400 West Covina Parkway location, Bright Now! Dental has moved to a new, nearby location at 1000 W. West Covina Parkway, Suite A. The new office has more patient rooms, state-of-the-art digital scanning equipment, convenient parking and a host of other amenities. Bright Now! Dental is committed to making it easier and more affordable for patients to get regular dental care. The convenient new location is open five days a week and has evening hours to accommodate busy schedules. Same-day, walk-in and emergency patients are welcome as well. 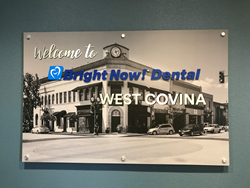 For directions to the new office or to make an appointment, patients can call (626) 338-4848 or 888-BRIGHT NOW (888-274-4486), or they can request an appointment online. Based in Irvine California, Smile Brands Inc. is one of the largest providers of support services to dental groups in the United States. Smile Brands Inc. provides comprehensive business support services through exclusive long term agreements with affiliate dental groups, so dentists can spend more time caring for their patients and less time on the administrative, marketing, and financial aspects of operating a dental practice. Smile Brands supports 360+ Bright Now!® Dental, Monarch Dental®, Castle Dental®, A+ Dental Care, OneSmile Dental, and Johnson Family Dental offices in 16 states, including Arizona, Arkansas, California, Colorado, Florida, Indiana, Maryland, New Mexico, Ohio, Oregon, Pennsylvania, Tennessee, Texas, Utah, Virginia, and Washington. Smile Brands is a portfolio company of Gryphon Investors (“Gryphon”), a leading middle-market private equity firm based in San Francisco, CA. For more information, visit http://www.smilebrands.com.